Several of you have commented on the beauty of the Arctic light. …and rivers freeze midstream – apparently in the very act of seeing them. 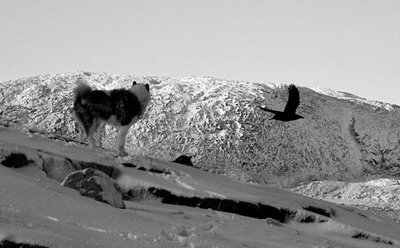 …where the hardiest beings run free and wild. And the rest of us stop to admire them. 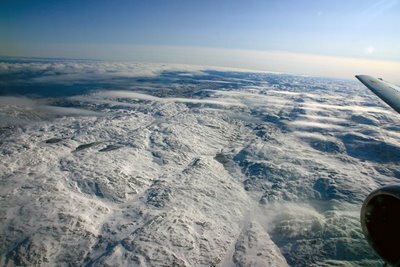 I remember years ago one spring flying over Ísland. 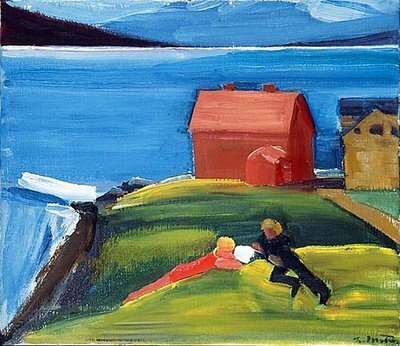 The island was a blue-green pearl far below trilling with snowmelt and running waters. But this time we had the chance to land. This is Vatnasafn – “The Library of Water” – in Stykkishólmur. In Vatnasafn are 24 glass columns containing water collected from glaciers formed millennia ago. In “The Library of Water” we can hold the glaciers – and their decline -- in mind again. Outside of town, the road could seem like an open question. Though there were moments when the question seemed like it could close again – in snowdrifts and icy crosswinds. But we had found and rented a familiar friend with good snowtires, who could take us over those roads that hadn’t been closed by winter yet. We’ve come to love this in-between season in which we’re traveling, this not-yet-winter in the north. Not the idyll of a springtime. But neither is the landscape unpeopled at other times. Fantastical shapes are all around you. And at dusk – or any time the world is thin – you might catch those ijjigait once again, those fleeting glances out of the corner of your eye. And you might find your own basalt and conglomerate world suddenly as peopled as any saga. …between the volcano and the sea. Or near at hand at Öndver∂arnes, it would’ve been Celtic monks who washed ashore in their curraich – their wicker-and-hide coracles – from across the sea. St. Brendan the Navigator had gone as far as Vineland in one of these. At Öndver∂arnes, the Celtic monks built their stone huts as well and a cloister wall out of lava stone. At the foot of the small mount of Helgafell is the grave of Gu∂rún Ósvifursdóttir from the Laxdaela saga. The mountain was sacred to the people of the age of the sagas, and many hoped to be buried here. The story is that if you begin at the grave of Gu∂rún Ósvifursdóttir and walk up to the remains of the monastic chapel that was once on top of the mount, and if you don’t look back or speak a single word, you will be granted three wishes. However, the three wishes must be pure-hearted, and you must not speak them to another soul. You’ve already seen a view from the top of Helgafell – when the world was thin. …you’ll feel the glacier at your back -- Snæfellsjökull. In Jules Vernes’ Journey to the Center of the Earth, Professor Lidenbrock discovers this runic manuscript in a 12c Icelandic book. When his nephew Axel deciphers it, they read that there is a passage into the center of the earth by means of the crater of Snæfellsjökull. …you might happen upon a labyrinth in the tundra of a little swale. And discover that you can enter the center of your own life, too. And people the landscape on your own. 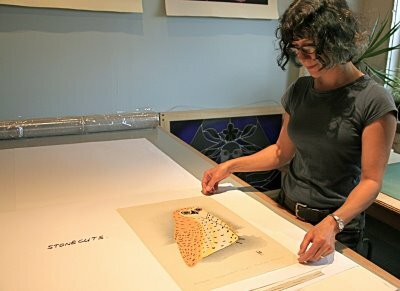 Two acclaimed women artists, living in different cultures thousands of miles apart. Each has had book-length studies written on their lives and work. 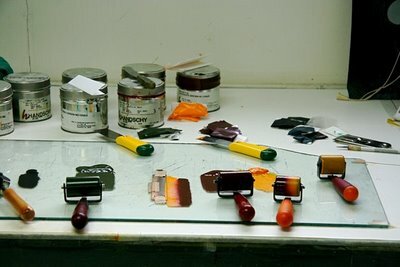 Each artist’s work is so recognized that it has appeared on a national stamp. 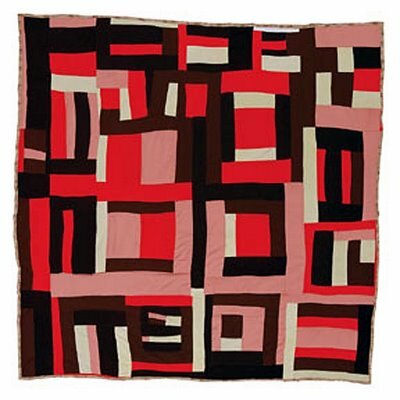 Mary Lee Bendolph’s “Housetop” quilt appeared on a 39-cent US stamp in 2006. 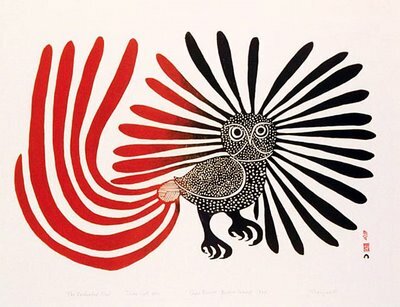 Kenojuak’s “Enchanted Owl,” a landmark print in Canada, appeared as a stamp there in 1980. But what most characterizes each woman aren’t these accolades and the appearance of their work in major museums around the world – but rather their humble spirits and their faithfulness to their communities and to the way of life that each has known and loved. 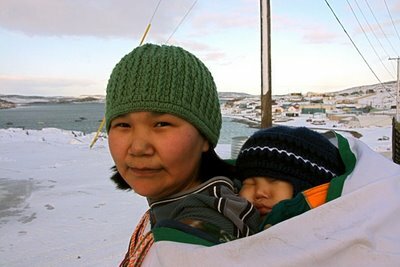 Kenojuak now lives in a home in town rather than in a qarmaq, but she chooses to live as the others in Kinngait do…simply. And she still loves to fish. 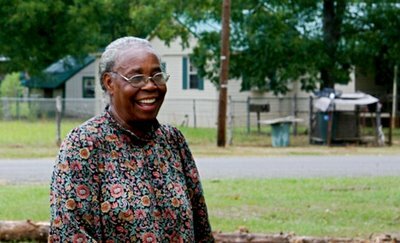 And you can find Mary Lee Bendolph, as we did, out tending her land. “I can walk outside and look around in the yard and see ideas all around the front and back of my house,” Mary Lee says. There are hidden places in the woods around Gee’s Bend where people pray. One of Mary Lee’s praying places is her barn. Both have had long difficult stretches in their lives. Both have raised many children and grandchildren whom they continue to help raise and support. And neither needs some high-blown artistic “theory” to explain how and why they work. They speak with a practical commonsense wisdom instead – and in neither case is their art dissociated from the rest of their day-to-day lives. 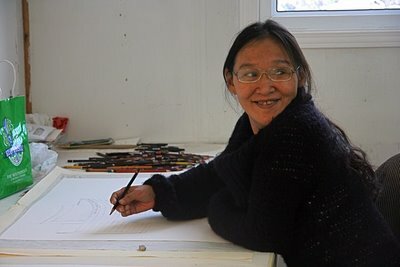 "When I'm doing graphic work, sometimes I have to hold the paper and look at it and feel it, and then the work starts to come out," Kenojuak explains. 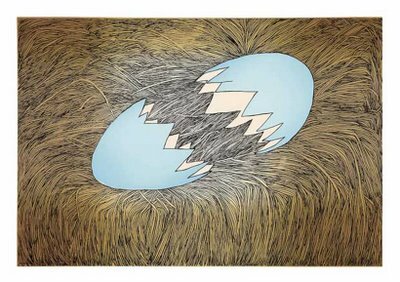 “A piece of paper from the outside world is as thin as the shell of a snowbird’s egg,” she also says. 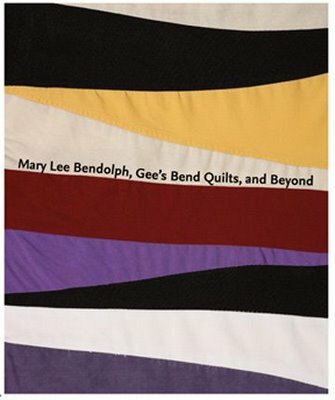 Once someone sent bell-bottom leisure suits to Gee’s Bend, thinking, “These people are so poor they could use these clothes.” But no one in Gee’s Bend wanted them either. Except Mary Lee. “I’ll take them,” she said. 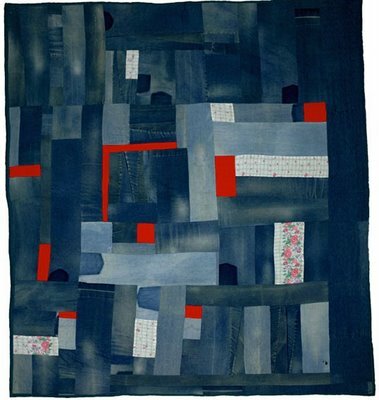 And she made a quilt from them..
It’s hard to clearly separate the figures of the two women. 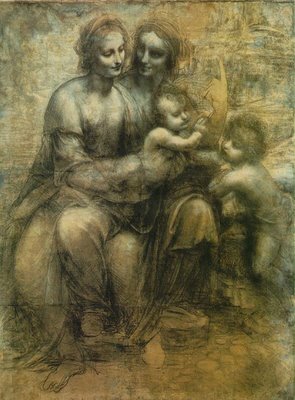 Mary gazes ethereally at her son. Her own mother, St. Anne, gazes with a fixity that seems both masculine and feminine at her. Mary has borne and will raise the Savior. Anne is the rock-solid support beneath them all. 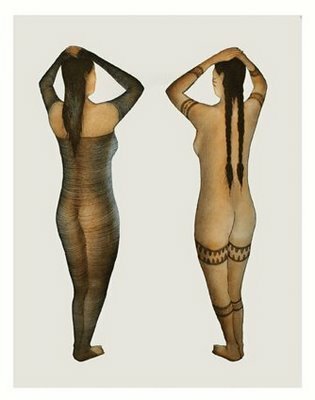 As I read what Debi’s written of Kenojuak and Mary Lee Bendolph – and am reminded of this Leonardo print that Debi keeps back home – I think of this beautiful indivisibility between the artistic and the motherly in these women’s lives. And I find myself asking: what is it about our own modern sensibilities and culture that we so often manufacture rifts between the two? An image that far from questioning the failures of aggression joins and reifies it instead. 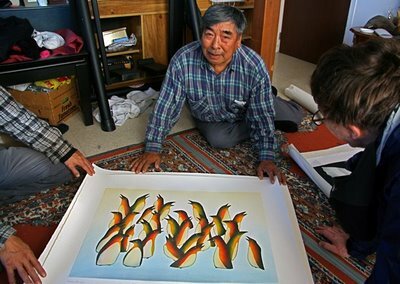 In 1948 and 1949 artist and writer Jim Houston made his first trips to Nunavut. 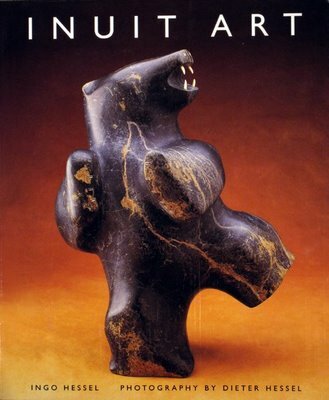 The carvings he saw fascinated him, and he learned that the Inuit had been carving for generations – amulets, talismans, tools for hunting. 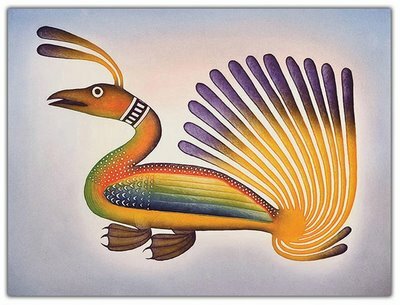 But he also saw other small pieces that had no apparent function, except that they were pleasing – pieces we would call art, even though in Inuktitut, as in many other aboriginal languages, there is no word for art. 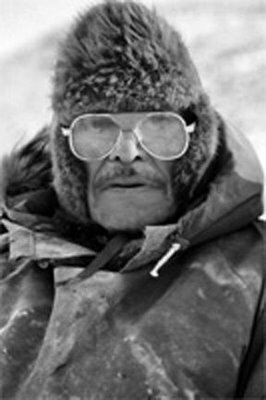 Houston also saw that in the changing Arctic the Inuit were having difficulty coming in from the land and adjusting to life in settlements. 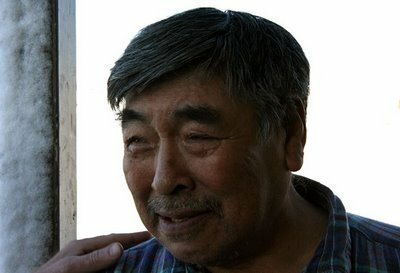 And he made a 260-mile dogsled trek to Kinngait to meet carver Osuitok Ipeelee. 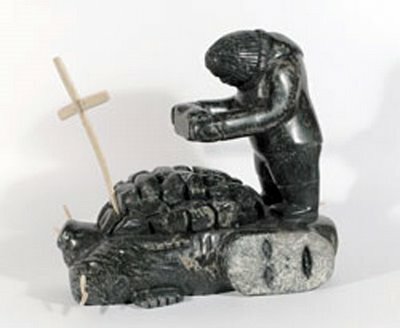 Osuitok did carvings enthusiastically for Houston and then gave his approval to Houston's idea for supporting Inuit art. 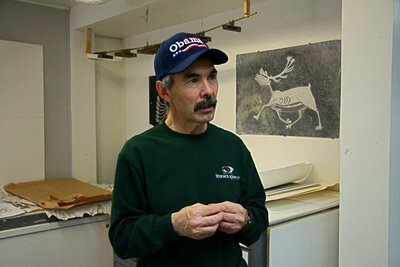 Houston deliberately paid Osuitok the then princely sum of $50 for a caribou carving. He wanted to get other Inuits’ attention. And he did. That carving by Osuitok is now in the Metropolitan Museum of Art in New York. Another one of Osuitok's elegant caribou appears above. 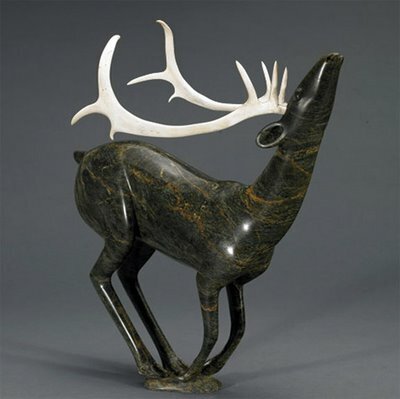 This second caribou is by Jackopoosie Oopakak. It is called "Nunali," which means place where people live. 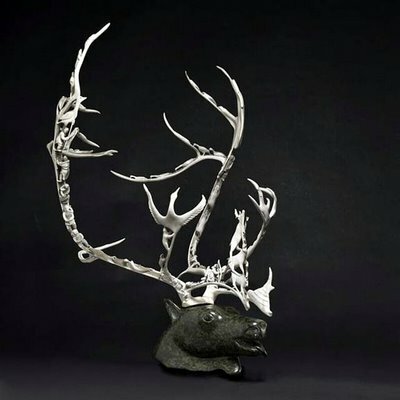 If you click on the image, you'll see seabirds, caribou, and Inuit hunters carved all along the antlers -- the whole cycle of a caribou hunt recapitulated again. Indeed, such a vision is a place where people live. 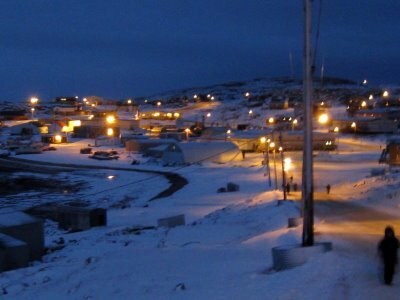 Soon after Osuitok and Houston's initial collaboration, what came to be called the West Baffin Eskimo Co-operative was born. 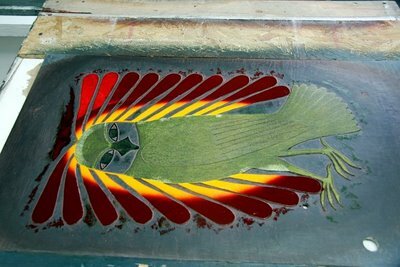 It has been in existence for fifty years now, and in addition to lithography and stonecut studios in Kinngait, it also operates a grocery and a supply store in town and administers government community service contracts. 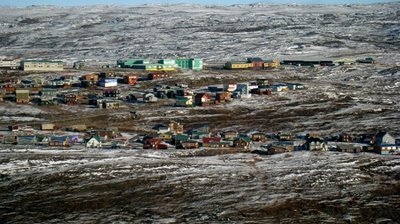 All in all, it is the first or second largest employer in Kinngait. 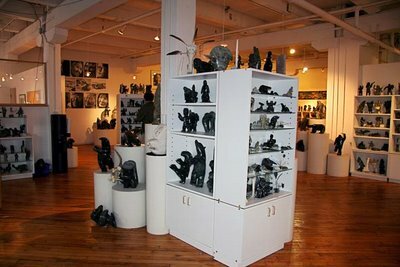 It also independently markets the work of its co-operative members through its distribution center, Dorset Fine Arts, in Toronto. 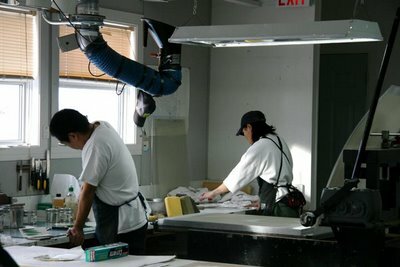 Current WBEC printmakers on their coffee break in “512,” the room that was the original center for the co-operative’s arts activity, so named because “512” was the original square footage of the center. Terry Ryan’s involvement with the co-operative has also been instrumental – and ongoing. 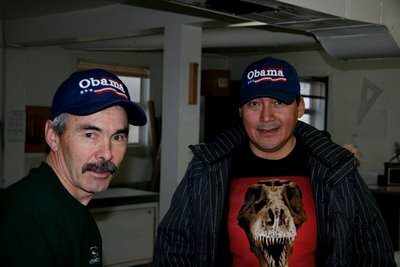 He’s on the left in this photo with Inuit leader Simonie on the right. The photo was taken in an Inuit camp in 1964. 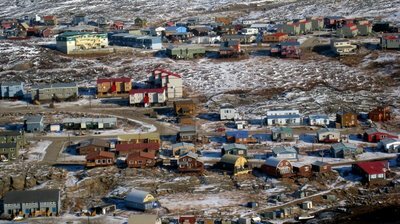 But the co-operative is wholly owned by its members -- all of whom are residents of Kinngait and almost all of whom are of Inuit descent. Jimmy Manning (on left) is the studio manager of the co-operative. 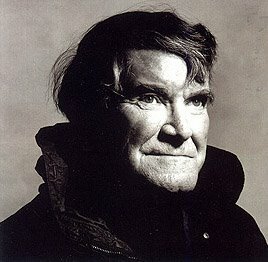 He is also a photographer, writer, carver, and painter. Palaya Qiatsug (right) directs the purchasing of carvings. You see how politically astute and prescient they were when we visited them before the US election. 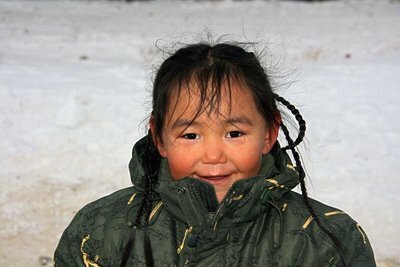 The mission is to communicate traditional Inuit culture to the young. 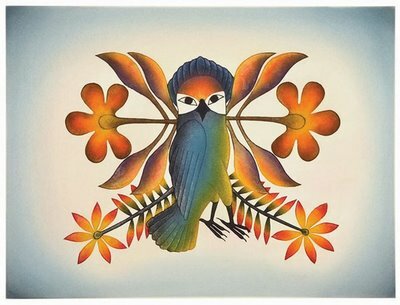 Each year since 1958 the co-operative has produced a collection of Cape Dorset prints. They only produce 50 sets of these prints, and this year’s collection was just about to appear when we arrived. We had had a sneak preview at Dorset Fine Arts in Toronto. 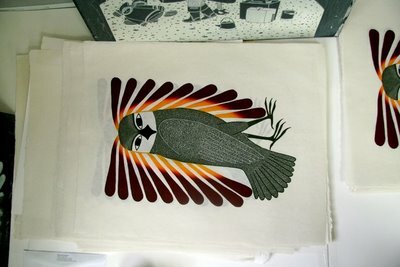 …including doing color samples on a print by renowned artist Kenojuak Ashevak. 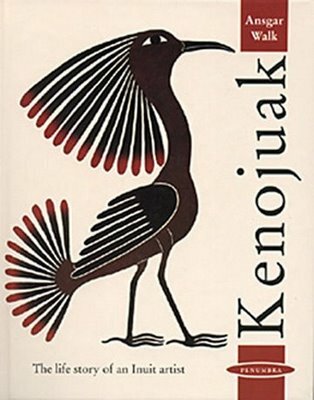 We'll introduce you to Kenojuak in our next blog. 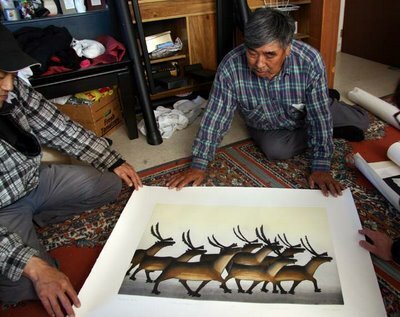 Kenojuak’s son Arnaqurk is an accomplished artist in his own right, part of a generation doing innovative new work. 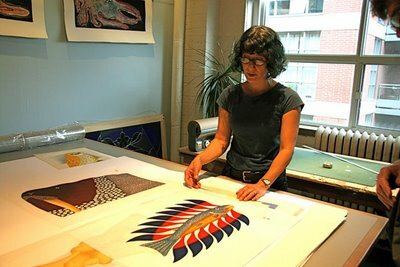 Arnaquak works as a lithographer. 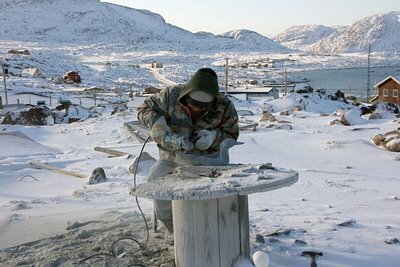 And he has been called “possibly the most creative and exciting sculptor in Cape Dorset today.” He is a constructivist and works with different materials at once. He thinks less of what might be taken away from stone and more of what might be added. 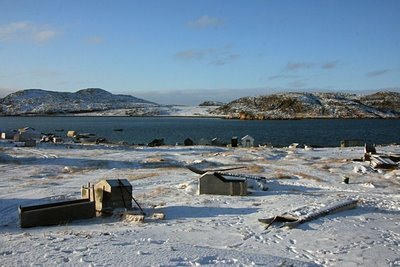 When he walks outside of town, or qajaqs, he might find bone or glass or baleen or antler that he'll later add to stone. It's when he begins to do his own work that the ideas arise. 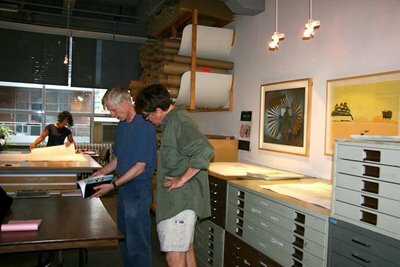 The braintrust gathered in the lithography studio. 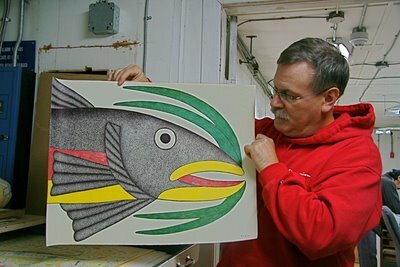 Painter, photographer, and printmaker Bill Ritchie from Newfoundland comes to Kinngait three times a year for about a month at a time to help advise in the lithography studio. 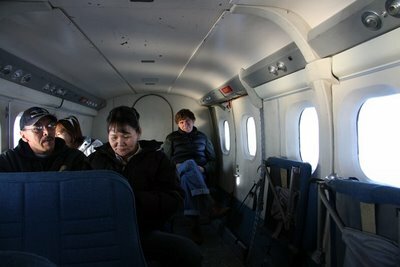 We flew up to Kinngait with Bill, and he helped introduce us to WBEC and the Kinngait community. As did Jimmy Manning, who manages the stonecut studio. Jimmy is also a guide. If we come back during summer, he'll take us out traveling in his boat. We can stay at two heated, comfortable cabins he has far from town. Then beyond the cabins, we'll be traveling and camping as the old ones did. There's a catch in his voice as he tells us this. 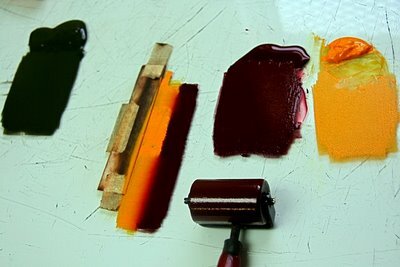 Sometimes, Jimmy says, it's perfectly clear that a drawing wants to become a lithograph. 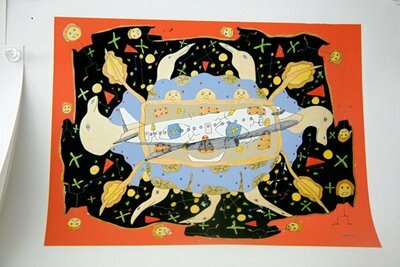 This is one of Kananginak's prints from the current 2008 print collection. So that this begins to happen. Qavavau Manumie is a multi-talented artist who cuts and prints stone blocks by day and who draws and carves at night and on weekends. 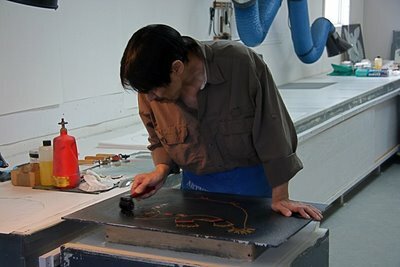 His images often appear in Cape Dorset Annual Print Collections, and when they do, Qavavau has undertaken every step of the process himself: drawing the original image, carving the block, making the prints. 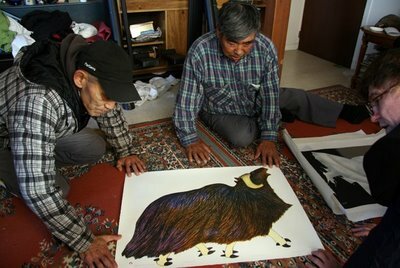 Here are drawings of Qavavau’s which might appear in next year’s Cape Dorset Print Collection. …and you’ll begin to perceive the wit and irony in them. 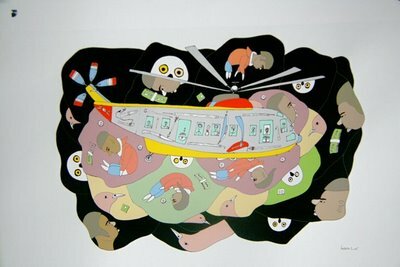 Shuvinai Ashoona’s drawings and prints derive from her own idiosyncratic perceptions as well. 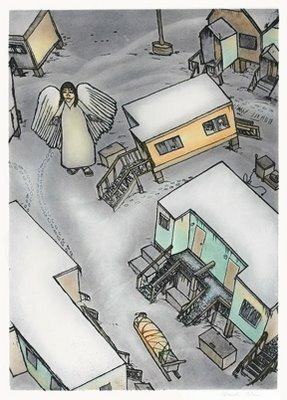 Shuvinai's print above is titled An angel in town. 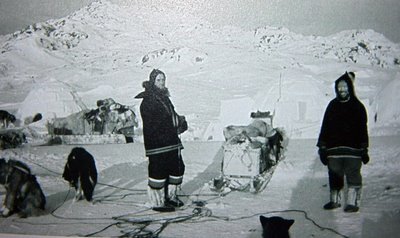 Notice the waiting, empty dogsled. Is someone arriving -- or about to leave? And she often treats controversial subjects that others avoid, like alcoholism and domestic abuse. 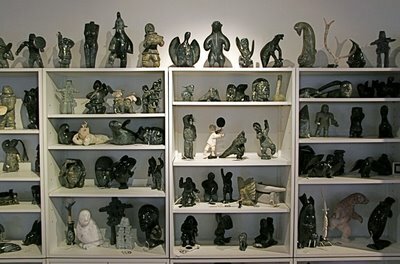 These aren’t all of Kinngait’s artists, of course – let alone the work of all Inuit communities. 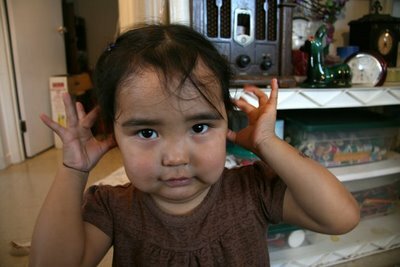 Nor, of course, are all issues smoothly resolved. 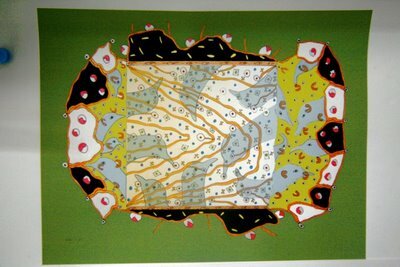 This print, “Shamanizing,” is by Aoodla Pudlat from Baker’s Lake. And the edge of old conflicts can still be sharp. 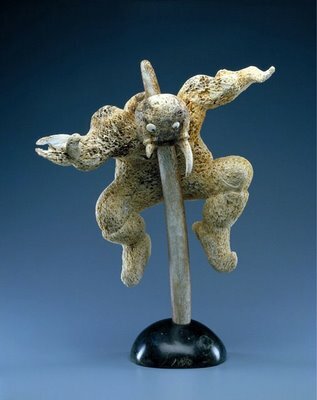 You’ll see the irony in how Karoo Ashevak’s “Harpooned Shaman” becomes its own crucifixion. 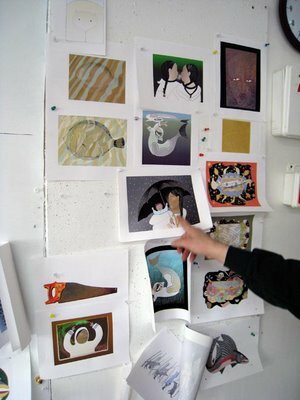 And there’s a dwindling pool of artists drawing and printmaking now. You can make more money more quickly from a carving than from the time a drawing requires. And now there are modern distractions as well – ones much less salubrious than this ski-do. These are all issues that Isuma, an independent Inuit film production group in Igloolik, explores in their work -- and not only by documenting Inuit culture. 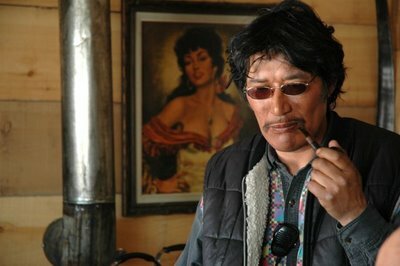 Isuma’s earlier, award-winning Atanarjuat (The Fast Runner) is available on Netflix. 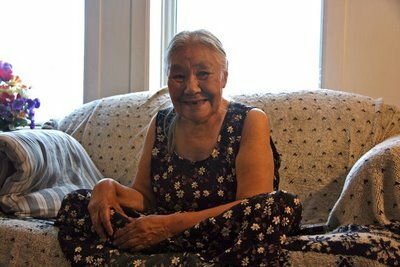 So Isuma is using this new medium as a means of recovering traditional Inuit storytelling. 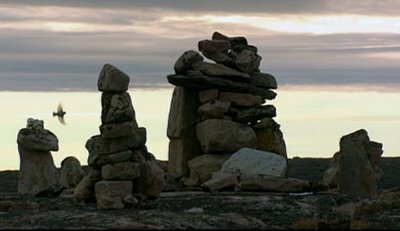 And it is also functioning as a collaborative community effort – the lifeway upon which the Inuit have always depended for survival. 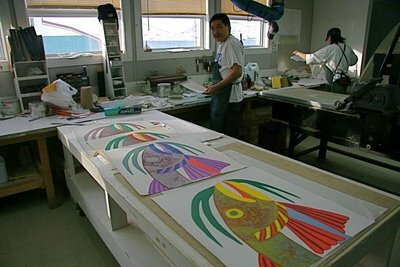 Again, Dorset Fine Arts in Toronto is the distribution center for the West Baffin Eskimo Co-Operative. 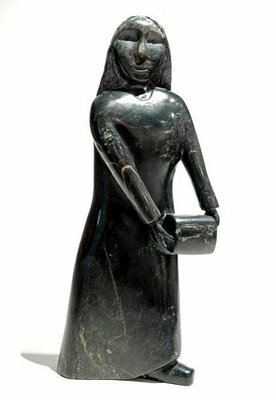 They sell Inuit work to galleries around the world. We -- Red Egg Gallery -- will be working with them, too. …let us know and you can purchase it through Red Egg Gallery. We know this is the first time we’ve specifically mentioned Red Egg Gallery’s function of selling artists’ work -- and we hope we’re making our own intention clearer: to serve the integrity of nature, community, and wisdom in local communities around the world. We’re hoping to connect you with artists, work, communities, histories – and places – that you love, too. Or, instead of walking across a land-bridge, you can try to get there by plane. …into this treeless land of ice and snow and wind. 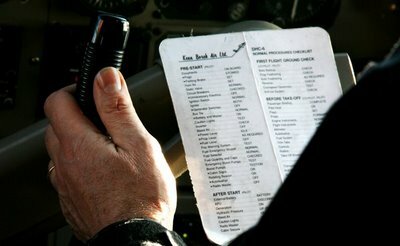 …even if Debi caught the steward/co-pilot reading through directions for take-off. Click on the photo above. You’ll see we aren’t kidding. 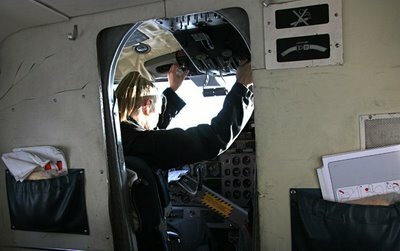 Because somehow the blonde pony-tail of our pilot consoled us, even though she didn’t seem any older than our daughters. 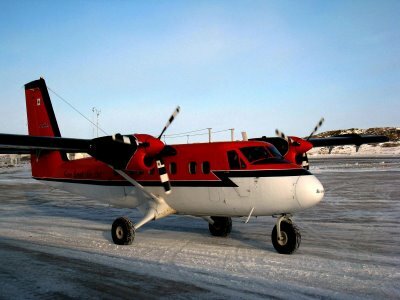 It was good to realize that the era of Arctic bush-pilots – not that she was exactly that – wasn’t completely over. 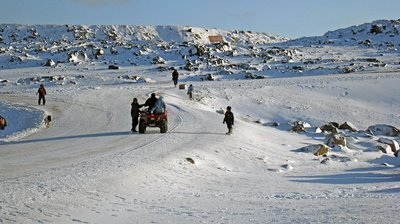 Iqaluit, the capital of Nunavut, seemed more ephemeral than a hunting camp. Because of permafrost, buildings have to be stilted above the ground. And the land itself seems perplexed by the mere idea of town. 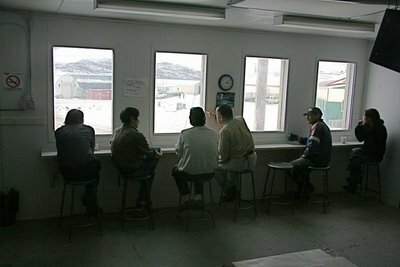 Like all towns in Ninavut, Kinngait is a new invention. 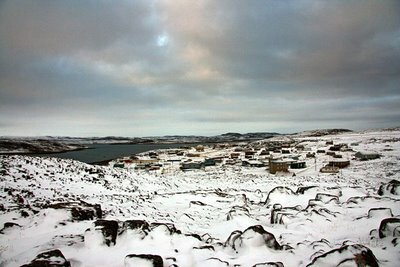 Kinngait’s colonial name is Cape Dorset. It’s sixty years old. 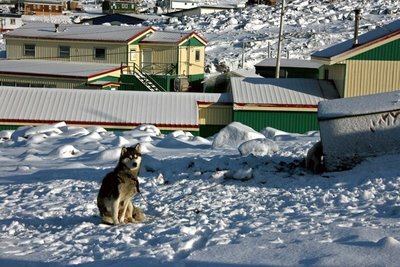 While Inuit have been living nomadically in hunting camps in Nunavut for over 4,000 years. This doesn’t mean that we didn’t find Kinngait’s modern incarnation full of charm. And its people utterly delightful. But that also doesn’t wash away the fact that something crucial is being lost. 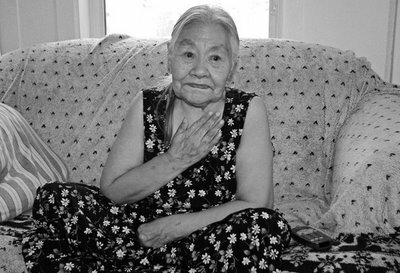 But we already living our own modernized lives have no right to wash our hands free of our own responsibilities – and we have no right to expect people like the Inuit to hold for us our own nostalgia for our own lost connections to the land. 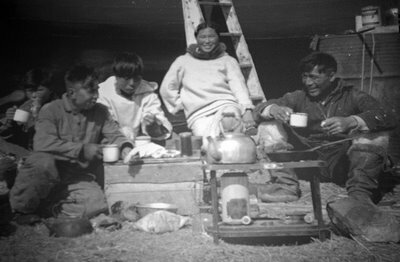 In 1913 the Hudson Bay Company built a trading post in Kinngait to facilitate their own trading for furs, and as Inuit families and hunting groups gradually moved closer to the post, a more settled community began to emerge. Not that the Inuit missed the irony and significance of this transition. This is carver and photographer Peter Pitseolak. 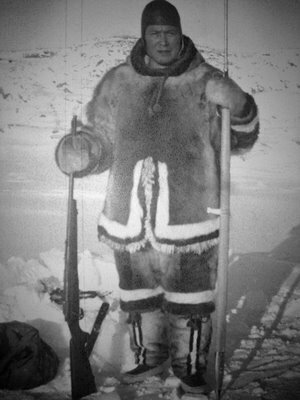 He has deliberately posed with a qakivak in one hand (a long-handled fishing spear) and a rifle in the other. 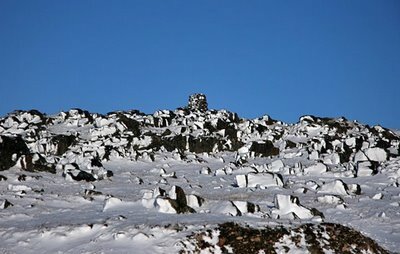 On a hillside above Kinngait, there is a memorial cairn to three men: Ashoona, Saila, and Potoogook (the namesake of our guide on Mallikjuag). 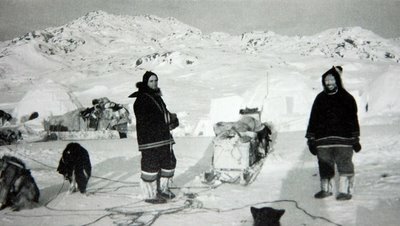 The arrival of these three men with their hunting groups is considered the start of the community in Kinngait – the beginning of a new era. And among the new skills required of these founders was knowledge of how to deal with qallunaat, white people from the south. Saila, one of these three founders, was the father of Pauta Saila, whom we introduced to you in our last blog. Here is one more of Pauta’s dancing bears. 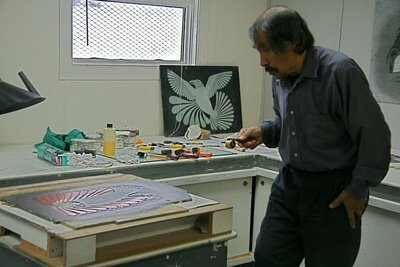 And carver and printmaker Kananginak Pootoogook is the son of one of the other three founders. This means that Kananginak and Pauta are direct links between a life of nomadic hunting and town life. And it means that their art has created a path for a younger generation. 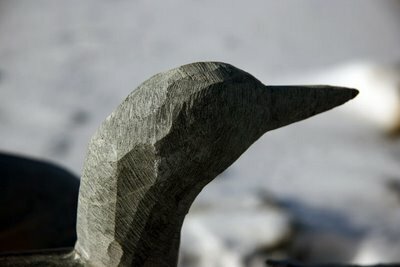 When Kananginak was still living in an outpost camp, he found a walrus tusk and carved a bird on it. He gave it to his father to sell in town. When his father returned, he brought back five bullets for Kananginak in trade. 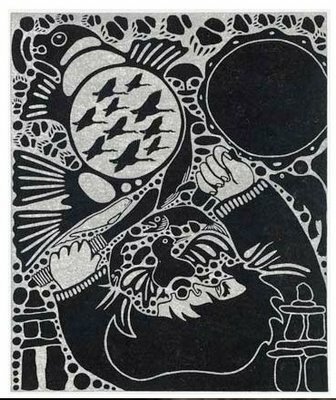 Now Kananginak’s carvings and prints appear in galleries and museums around the world. It is impossible to explain how one small community like Kinngait, whose population is perhaps 1400, could produce so many thriving artists. 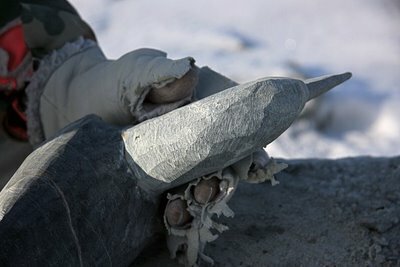 But one partial explanation lies in how long the Inuit have so skillfully used their hands. 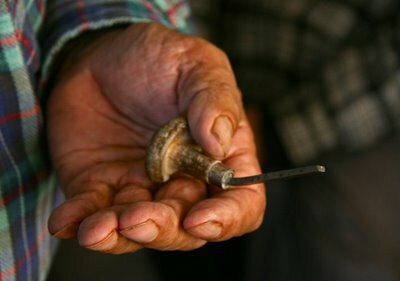 If men and women could not have made and mended their clothes and gear at a moment’s notice out on the land – their kamiik (boots), avataq (sealskin floats), and so many other things – they simply would not have survived. We suppose some might want to argue with the transition to a modern tool. But we don’t see the point. 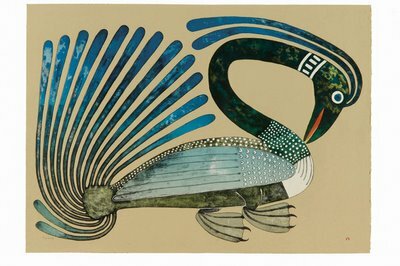 This is a loon by Etulu Etidloi, the father of Isaci Etidloi, whose sculpture a man could die at any time we showed you in our last blog. You see the generational passing of this art. 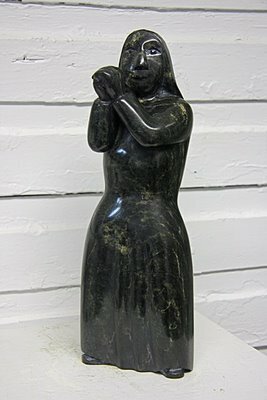 The Inuit first carved mainly on ivory and traded with the occasional whaling ships passing through. 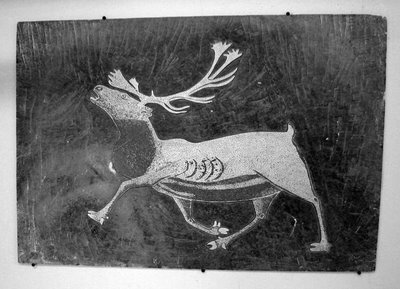 Even when Kinngait was on its way towards becoming a settled town, it was still an exciting moment when a dog-team would arrive and as a family unfurled sealskins, among the furs there might also be a carved masterwork or two, by now perhaps carved in local serpentine that can range in color from yellow-green to nearly black. 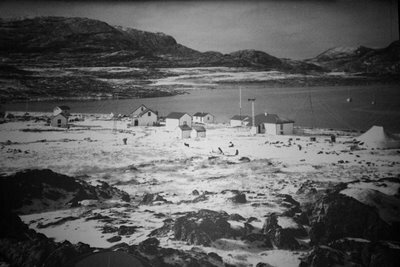 The above photo was taken at an Inuit campsite about 1964. 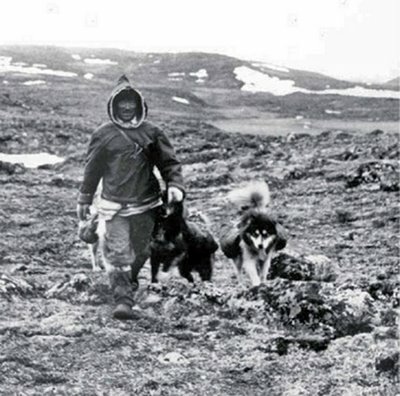 In the 1950’s disease ran through Qimmiit, Inuit dogs, and the Canadian government undertook, or ordered to be undertaken, wholesale slaughters of the dogs, purportedly for public health reasons. 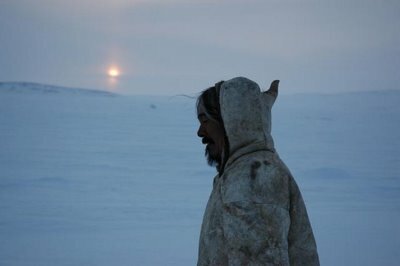 The connection between the Inuit and Qimmiit would be hard to over-emphasize. One could not have survived without the other. 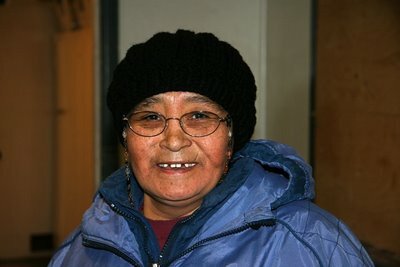 "My grandmother often told me that I am still alive today because of our Qimmiit," Paulusie Cookie from Umiujaq said. The slaughtering of the dogs remains a controversy. 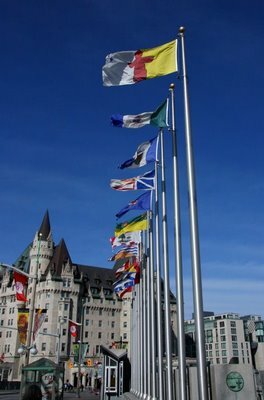 In the post-WW II era, military activity was “setting up the Distant Early Warning line across the North to protect North America from attack.” The northern mining industry was booming, and a young Canadian government feared the possibility of larger powers trying to annex these sparsely populated lands. 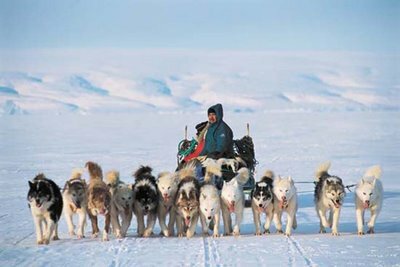 And there are those who still fear the dogs were slaughtered to force the Inuit from their nomadic hunting lives into fixed settlements. 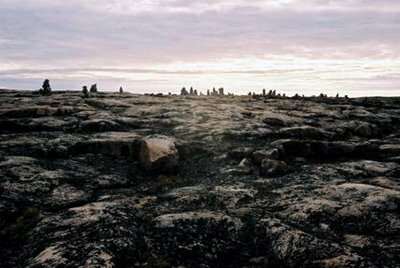 This history leaves big questions – and not just for Kinngait. Perhaps one way to frame the question is this: how can our life in town stay connected with the land – and with the spirit of our ancestors who have lived on the land before us? 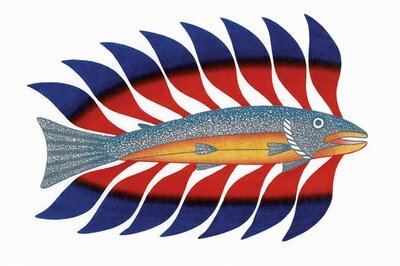 Or in other words, how can Cape Dorset stay connected with Mallikjuag? But this is a question we have to own in our own lives – and not just expect that it’s a responsibility that people like the Inuit should carry for the rest of us. The last time we saw Hass, he didn’t have answers to his own good question. What’s important is that the good question remains.